Welcome to the homepage of Hollolan Kotiseutuyhdistys local heritage society! During summer 2017, the exhibition “Hollola muutoksen pyörteissä” (”Hollola going through the winds of change”) is on display in the artefact museum. A textile exhibition continues in Ylä-Kölli’s house. The artefact museum is in an old parish storehouse, which was built in 1855. It is located in the north-west corner of Hollola cemetery. The local heritage society bought the parish storehouse in 1952 and the renovation of the place was completed already the following year. At the same time, artefacts were being collected and listed to become part of the museum. The artefact museum was opened June 3rd in 1960. The floor below the artefact museum used to be a storage for grains, which is why it has double wooden walls. Double walls kept the air fresh and prevented theft. 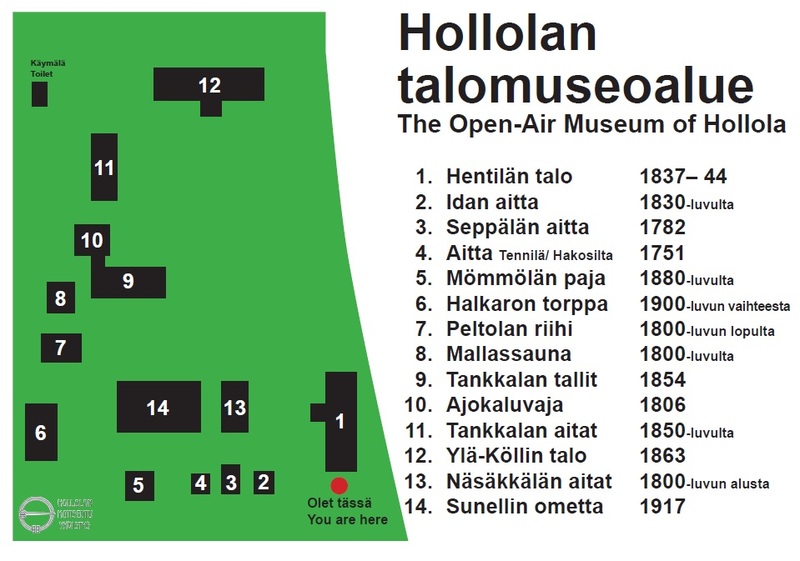 The permanent exhibition presents the results of the archaeological excavations in the Hollola area. The exhibition has been renewed in 2006 and 2007 by Lahti City Museum. The open-air museum of Hollola is a remarkable display of the old buildings in the countryside. The oldest log buildings are from the end of the 18th century and the newest ones are from the beginning of the 20th century. The museum area includes the main buildings Hentilä, Ylä-Kölli and Halkaro, which have been moved here, three small sto, a smithy, two buildings moved from Tankkala (built together), a barn and a shed as well as a drying barn, a hop garden and a malt sauna. Annually before midsummer, the sahti ale championships of the municipality of Hollola are held at the open-air-museum. Every other year in August, a harvesting festival is also held. Hollola’ municipal house is located opposite the church bell tower. This national romantic style log house is a restaurant cafe, which is open all year. The place can also be reserved for private events. The house has excellent acoustics and a piano is available for use. Sometimes the opening hours are affected due to private events.